The Shade of the Moon by Susan Beth Pfeffer. The Conclusion to the Life As We Knew It Series. Review: Have you ever been regretful of your actions or thought you hurt someone in a way that would fill you with guilt? Or have you been going over your life and seeing it as if the fate of your family is on you? 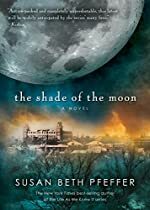 If you have, you would be a lot like Jon, a boy in the story The Shade Of The Moon by Susan Beth Pfeffer who feels all of this and does what he can to keep the people he loves safe. Jon is a slip, a person that was barely allowed to get into a home, of an enclave in Sexton, Tennessee where he lives with his stepmother Lisa and stepbrother Gabe. The people of these home areas are separated between grubs and clavers Lisa has to be evaluated which determines if she can stay or if she has to go and leave Jon and Gabe behind. To protect Lisa, Jon has to be the "best of friends" with a boy named Tyler, the boy whose father determines the outcome of the evaluation. The problem is that Jon falls in love with a girl named Sarah who believes that all humans are the same even if they are grubs or clavers. Since Tyler and his pals are clavers, which mean that they do not feel the same way as Sarah feels about grubs, they do not treat her well. Jon decides that after the evaluation, he will forget about Tyler and love Sarah. But if Tyler were to be treated this way, Sarah will pay a price. Can Jon protect Sarah and love her at the same time? Will he be able to save Lisa's evaluation? Or will the people haunt him as a girl named Julie haunts him? The Shade Of The Moon is intended for children 12 and up because of the foul language that can be found in this book and the more mature actions. It is a good book for all kinds of children, but people interested in romance might like this more than others. This is a really good fantasy book that shows people to do the right thing even in tight situations and that love always finds a way. Review written by Yesenia (6th grade student). We would like to thank Houghton Mifflin Harcourt for providing a copy of The Shade of the Moon for this review. Have you read The Shade of the Moon? How would you rate it?